We love the sport collectively as a family, but it's my husband's pride and joy of all sports, which is quite funny considering he's from England. He looks forward to opening day for months. In fact, he and a bunch of his cronies headed to Cleveland last week for their opening day. He couldn't wait for the season to hit here. Unfortunately, my daughter continues to break his heart where the sport is concerned. He is a diehard Atlanta Braves fan, she is a Colorado Rockies fan. Why? Because the team wears purple. What can I say? We're girls. We do that. Thankfully, he's extremely patient and forgiving. I decided to celebrate our city's opening day with some cupcakes. I don't know what it is with me and cupcakes lately. I haven't abandoned my love of cookies, it's just that cupcakes have been calling to me more so than usual. Mind you, I do think I need to make a batch soon. I don't know if it's me or all the sugar I've been ingesting lately, but just the other day, I SWEAR I saw my cookie jar flip me the finger. But that, my friends, is a WHOLE other ballgame. **This recipe yields 2 cups. The frosting recipe I have above is for 12 cupcakes. You can either double the frosting recipe or store remaining caramel in an airtight jar in the refrigerator for the next use. This is really tasty over vanilla ice cream! In a small saucepan, add sugar and water and bring to a boil over medium-high heat. Continue cooking, without stirring, until mixture turns dark amber in color, about 6 to 7 minutes. It will turn fast, so do not leave the stove! Remove from heat and slowly add heavy cream and vanilla - the cream WILL bubble like mad, so be careful. Stir with a wooden spoon until completely smooth. Add butter and stir until melted. Preheat oven to 350ºF. Line two 12-cup muffin trays with cupcake liners. In a bowl, combine flour, baking powder, and salt; set aside. In a large bowl, beat butter, peanut butter, and brown sugar together until creamy. Add eggs and vanilla and beat again until light and fluffy. Add flour mixture to butter mixture, alternating with buttermilk, beating together until incorporated. Scrape bowl down. Fill liners about two-thirds of the way. Bake for 14-18 minutes or until toothpick inserted comes out clean, checking as soon as 13 minutes. Do not overbake. Mine were done in 17 minutes. Remove from oven and transfer onto rack. Allow to completely cool. Using an electric mixer, add butter and beat until light in color and fluffy. Add salted caramel and powdered sugar slowly and mix until fluffy and completely incorporated. Cover and refrigerate until stiff in form, but still spreadable. 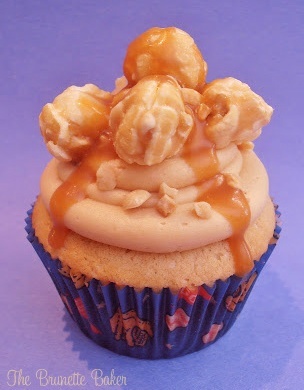 Pipe or spread cupcakes with frosting and top with caramel corn and chopped peanuts. Drizzle with salted caramel.